I'm the leader of my guild. 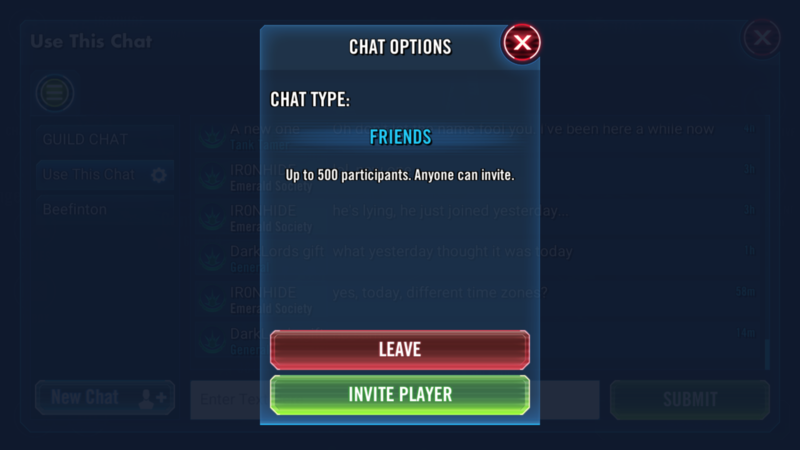 Sometimes I go to leave this screen after inviting members to a chat and I get stuck. I then have to restart my game. Doesn't seem like a huge deal unless I do something in the middle of a battle which happens often. It's hit and miss but it's becoming a bigger thing than it was as I continue to lose battles in TB etc. Maybe I'm a slow learner and I shouldn't handle my guild matters during a battle...? But I don't like to keep my members waiting. Please fix this bug. Ps sorry I didn't know where to put this as the option for bugs and technical issues was greyed out. I have the same issue. I'm also a guild leader, I doubt they are connected but just in case. I’m not a guild leader but I have this issue too.